A large crowd enjoyed the music, activities and great weather on Saturday for the sixth annual Forestburg Watermelon Festival. Marli Baysinger, one of the event’s organizers, stated that this was one of the best crowds the event has drawn. Forestburg’s annual Melon Festival was held last Saturday, Aug. 18. Corliss Avenue was paved just before this week’s festival so that attendees were able to see the product of the hard work and generous donations from previous years. With the road complete, entry into this year’s Melon Festival was free, with free will donations accepted. This resulted in reportedly the largest crowd in the festival’s history. Entry will continue to be free in the future. …Read on and see more pictures of the event in this week’s issue of the Sanborn Weekly Journal! CREW members work to complete the road before this year’s Melon Festival in Forestburg. The town of Forestburg has been working on raising funds to pave their roads and fix the roads to be more passable and easier to maintain during the winter months. The Forestburg Community Development Corporation (FCDC) has been organizing an annual Melon Festival to raise money to help defray the costs of this much needed project, and on Aug. 2, their work was rewarded. 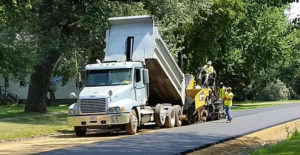 Corliss Avenue, one of the main roads in Forestburg, was newly paved by Commercial Asphalt of Mitchell. …Read on in this week’s issue of the Sanborn Weekly Journal! MITCHELL — DWU’s Commencement ceremony took place May 6 at the Corn Palace in Mitchell with 189 degrees conferred – 151 bachelor degrees and 38 master degrees. Those graduating included Rachel Selland, with a Bachelor of Arts in Elementary Education, and Lindsey Thompson, with a Bachelor of Science in Nursing, both of Woonsocket, and Karli Voorhees of Forestburg, also with a Bachelor of Science in Nursing.